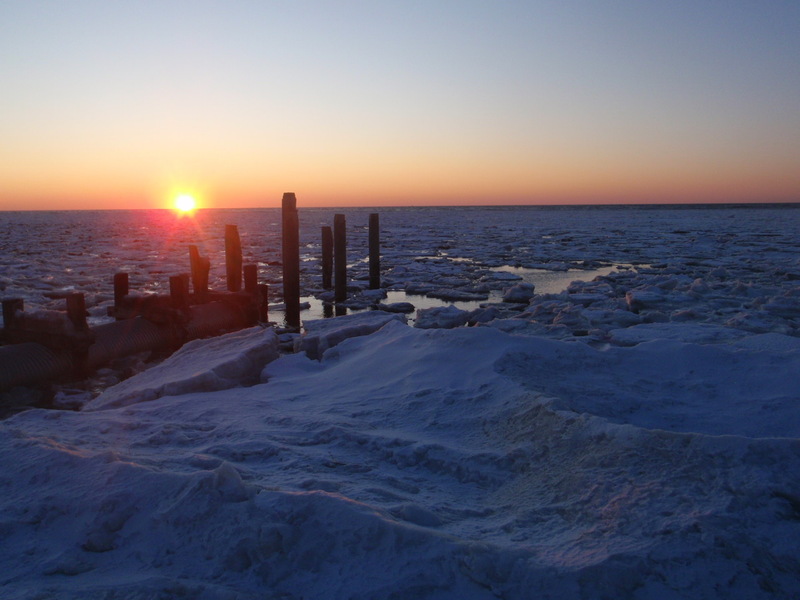 5:23 P.M. here--the sun stands still, shifts its mass*, and heads back north. 6 months ago, when we sat on the opposite side of the sun, I celebrated the summer solstice, a joy tinged with the weight of knowing the sun would start its slow, long course southward. Winter is only hours old, and winters can be brutal here. The light, however is returning. When I was a child, winter meant cold, summer heat. I did not, could not, grasp why the elders got so excited late December, at the cusp of winter, when we faced long wintry days. I stood outside last night in the chill with my youngest, now a quarter century old, watching our shadow drift across the moon, a wavering copper-gold washing in from the moon's left. My mom used to tell me she could see me as an infant even as I stood before her as a man. I laughed, of course. I am big--over 200# big. I still give tests, more out of habit than sense now. Performance on science tests a few days before the Christmas break follow a predictable pattern, and my students did not fail to fail. We do a lot of things because we do them. If mastery's the goal, then a class average of low 70's with a bell-shaped curve, a science teacher's dream a generation ago, marks my failure. On my board today two-foot numbers announced the time of the solstice--5:23 P.M. Solstice literally means the sun stands still. Very few students notice how far the sun has shifted since class started just 3 1/2 months ago. There's no need. Food comes in boxes, heat in radiators. The whole world of technique is magic to them. In Ireland this morning, the sun rose, as it has, as it will. 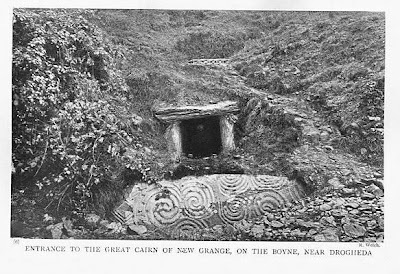 A shaft of sunlight flashed through a chamber in Newgrange built thousands of years ago, before the Great Pyramids, before the Celts arrived, before Stone Henge. We will not study this in science, nor will our students study this in history class. We will create a class ready for the 21st century, for the abstract, for a culture that confuses bank profits with economy. If children owned the winter solstice, the dying light, knowing what waits for each of us before a 100 winter solstices pass, would they come to school? I believe schools can be worth the time children invest in them. I am not convinced we're there yet. At least not as long as I keep practicing education as religion, using a script written generations before me. *The sun may indeed change direction if we use Earth as the reference point, but "shifted its mass" is, of course, incorrect, since it implies uneven forces were applied to it. Since I have yet to find a better explanation for "mass" beyond "the amount of inertia stuff has," even a poetic license does not give me permission to spew such nonsense. 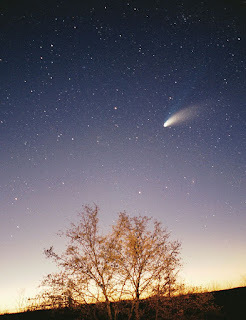 Another comet hangs in the sky. Here's a story from years ago. Everyone knew, and yet no one would say it. Her mother asked that no one tell her child what was going on. I saw her after her surgery, her head wrapped like a genie, sitting on her bed. Her mother wanted me to promise I would not tell her. I told the mother I would not lie if asked. The comet hung in the sky like a jewel that summer 20 years ago. I asked the other if I could take her child to a room where the comet was visible. She did not come along. I knew what I would say if the child asked. The mother knew as well. And the child never asked. But she saw the comet. The last one she saw. Not the last one I saw. And Hale-Bopp makes me sad every time I see a photo. She never asked so she could protect the adults around her. I took a walk barefoot along the edge of the bay today. It's December, so I am re-posting this. 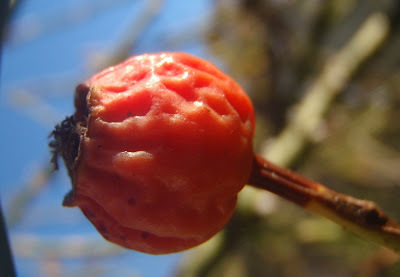 A rose hip in December. My imagination fails me, as it will, surrounded by human light, human sounds, human smells. I cannot remember the smell of honeysuckle or the soft glow of lightning bugs or the warmth that wrapped around me in early summer. I keep a small jar of rich soil dug from my compost pile on my desk in school. Now and then, in the middle of class, I take a whiff. The children see my joy I get from the earthy aroma. My lambs know by December that I want them to have happy, useful lives. They know I want this for every one of them. Thomas Jefferson got the tone just right when he penned "the pursuit of happiness." It is not an idle phrase, though it does sound a bit embarrassing in context of the modern classroom, the modern office, the modern mall. Jefferson lived before we learned how to distract ourselves with twisted visions of immortality. We have become our own gods. Mortal illness comes as a surprise, dismissed as an inconvenience. Our cultural psychosis belittles those among us who dare to expose our mortality--if they only believed hard enough, they would be cured. Ironically, the generation closest to achieving immortality is least equipped to deal with it. Time spent on-line chasing zombies or aliens or a Nazi nation long since quelled hardly seems worth all the fuss. We no longer seek a life worth living. We'd just rather avoid death. Death is inevitable. Pursuing happiness is not. Yesterday one of my students came running up to me with a pot of tiny basil plants she had sowed a few weeks before. I did. And I glowed. Growing a plant in a classroom fits in the curriculum. A child sharing her joy at its sensuousness is not. The seed, no larger than the head of a pin, darker than a cloudy December night, grew in a pot of peat. 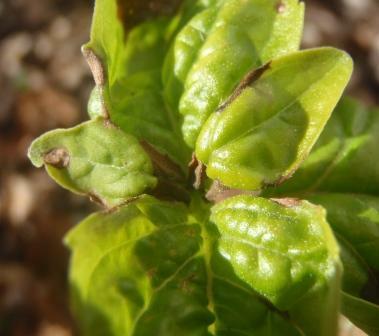 Shiny green leaves erupted from the seeds, now effusively shedding aromatic molecules that made me grin in December. Something from nothing, at least nothing we could see. The poets have something to say, but so do the biologists. The aroma released from the leafs was made of carbon captured from the breaths of the same student clutching the pot. If you've never sown a seed before, this is a big deal. If you've sown seeds for much of your life, it's still a big deal. A hundred years from now, the human world may be very different, but seeds will still grow when planted. None of us know what this world is all about. A few among us will tell you to live a certain way in order to reach worlds that no one has seen. A few among us will tell our children to live a certain way to strengthen abstract concepts like country, or economy, or success. Success is a slippery word, but happiness is not. You know when you're happy, even when you're not sure how you got there. Life, liberty, and the pursuit of happiness--how many of these fit into your district's curriculum? How many fit in your classroom? If we continue to raise our kids for a better economy, a better nation, a better world while neglecting their inalienable right to their pursuit of happiness, we risk the "blood-dimmed tide" Yeats spoke of. Happiness is not happenstance, nor is it trivial. Mortality is not happenstance, nor is it trivial. Why did you walk into your classroom today? Did you give your lambs at least as good as reason?